How does one become a writer, a professor, a university administrator, and a national education leader? Tomás Rivera took the rocky path of a migrant farm child in the 1930’s, encouraged by family, mentored by a special librarian, and inspired by his love of books. 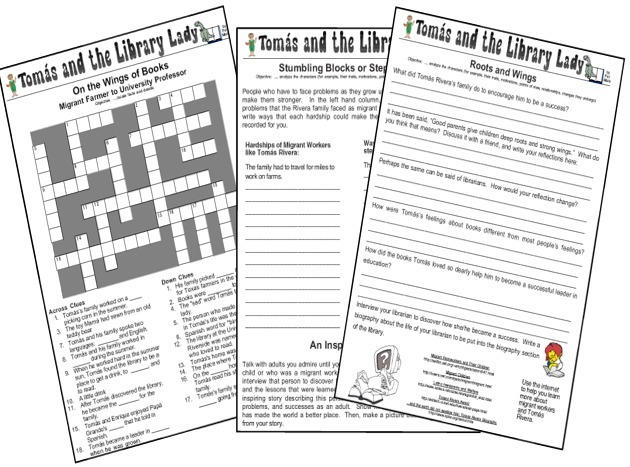 A literature guide for Thomas and the Library Lady is included in the Kids Wings Tales for Two Centuries collection of literature guides for award-winning novels and intermediate-level picture books. This collection comes in a spiral-bound book with CD and site license for one school. The Tales for Two Centuries package includes 20 literature guides for award-winning books, over 200 pages of activities. You can purchase a literature guide individually for around $12.95, but if you order Tales for Two Centuries, you can get 20 literature guides on sale, for less than $.65 each! This is one of the best bargain in the USA, while quantities last!